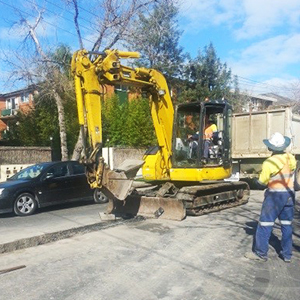 As the water main system ages and deteriorates, we replace pipes and keep the system in good working order. We normally upgrade a section at a time (approximately 200 metres), and try to minimise the impact on customers, as well as on other services, and the environment . If there is a water main renewal planned for your area, this is what you can expect. You will receive a letter in the mailbox a few days before we start work. In some cases, we will install a temporary water supply above ground, via a blue hose. Ramps will be placed to allow vehicles to drive over these pipes. It is a good idea to let the contractor know if you need this altered for any reason. We may put an attachment onto your water meter to connect a temporary water supply. Make sure your water meter is accessible. There will be noise while the project is in progress, but almost certainly it will be restricted to normal working hours, Monday to Friday between 7am and 5pm. There will be new pipes, machinery, building materials (such as gravel), a storage container and work trucks in the street and nature strip. There will be holes in the nature strip, covered with boards so we know where other services are located in the ground such as gas, so our workers are safe and other services aren’t disrupted. As we upgrade the main, we may also replace or move hydrants in your street to provide better access for firefighting services or make the system work more efficiently. There will be some construction noise and traffic disruption while we are working but we will do our best to keep this to a minimum. 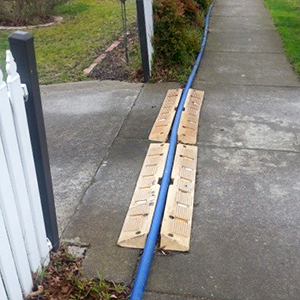 Even when a temporary water supply is installed, at some point we need to interrupt the water supply for a few hours to connect the old pipe to the new pipe. Typically, this work is done during business hours to minimise the disruption to customers. We’ll also make arrangements with businesses, but it is worth making contact with us to discuss how your business will be affected. You will receive one week's notice of any planned water interruption. If something unexpected occurs such as if the temporary water supply is damaged, we cannot give you advance warning. If this happens we will work as fast as we can to get the water back on. Before leaving the site we do surface restoration work, called a reinstatement. Grassed areas such as nature strips are tidied up, top soil is spread over the area and new grass seed is sowed. Please minimise the amount of traffic on the areas to allow them to be restored. In summer, it can take longer for the grass to grow back. Hard surfaces such as concrete and asphalt are usually reinstated within two weeks of completion of the job.